“This entire album is about time,” Whalen says. “It’s about pulling time apart and putting it back together." 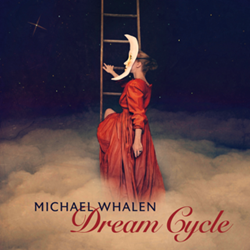 Emmy award-winning composer and Yamaha artist Michael Whalen wants his music to put you to sleep. His new album, “Dream Cycle” (Valley Entertainment) succeeds at this, inspiring rest, relaxation, wellness, meditation and ultimately, sleep—a crucial activity that eludes so many of us, particularly in these unsettling post-election days. Sleep is such an important part of everyday life—something Whalen learned first-hand from 300,000 of his fans who listen to his music each month on Spotify, largely to relax, meditate or sleep. Struggling with his own severe sleep apnea, and motivated by saving his own life, at age 50, Whalen started on this journey by transforming key elements of his daily routine. At his heaviest, Michael weighed nearly 345 pounds. With a strict doctor guided diet, regular exercise, a daily 7.5-mile commute from Brooklyn to Manhattan and a daily scheduled sleeping regime, Whalen has lost more than 120 pounds so far and his goal of weighing 175 pounds is in sight for the first time since his teenage years. Whalen also engaged vocalists for Dream Cycle: Maine-based a cappella singer, Amy Robbins-Wilson sings a beautiful rendering of “Hush (Little Baby, Don’t You Cry)”; celebrated Celtic artist Liz Madden offers her talents on a hypnotic treatment of “Little Star (Twinkle)”; Based on a one-hour conversation with Whalen, Kathy Fisher of the Los Angeles-based band Fisher did a vocal reimagining of Eurythmics’ 1980s super-hit “Sweet Dreams (Are Made Of This)”; with shadows and cinematic colors replacing the original groove-driven conception. And The New Tarot, a wonderful new sister duo from Brooklyn, cast a vocal spell on the Cranberries’ hit song “Dream” complete with Whalen’s gorgeous re-harmonized arrangement. In the end, Dream Cycle harkens back to Whalen’s past offerings, Nightscenes: Music For The Evening (1996) and Like Rain Through My Hands (2004). But it also stands separate from these landmark ambient albums. The main delineator, as he sees it, is rhythm.